This must-have addition to any hot water recirculation system will help you maximize the efficiency and minimize the cost of your hot water delivery. It’s almost second nature: You turn on the shower and go off to do something else, knowing full well that it will take a while for the water to heat up. Only when you see steam rising from the stall do you finally climb into the shower. A similar dynamic plays out in the kitchen, where you routinely let the faucet run for 10 seconds, 30 seconds, or even a minute—however long it takes for the water to reach the optimal temperature. Taken together, such instances of delayed hot water delivery waste a considerable amount of time. But there’s more to it than mere inconvenience. Every second you wait also wastes a considerable amount of water and, by extension, money. In fact, the Department of Energy estimates the average household fritters away—and pays for—12,000 unnecessary gallons of water each and every year. “A typical hot-water recirculation system works around the clock,” O’Brian says. That means the system draws power and pumps water all day, every day, whether or not you even need hot water. The result? “You get the day-to-day lifestyle benefits of instant hot water,” O’Brian says, but ironically, “operating a hot-water recirculation system adds more to your electricity bill than it subtracts from the bill from your water company.” More advanced recirculation systems gain energy efficiency by operating on a timer, but even these new-and-improved models come with a downside. “You have to reprogram the timer whenever your schedule changes, or when you host a houseguest who happens to be on a different schedule, or when the clocks change.” For many, “configuration proves to be more trouble than it’s worth,” O’Brian concludes. Note that while the SmartPlug defaults to its money-saving “smart” operation, there are two additional modes. In “pulse” mode, the SmartPlug maintains a steady, always-at-the-ready supply of hot water throughout the home—not by running the recirculation system all the time, but rather by running it intermittently (five minutes at a time with 10-minute breaks in between). Meanwhile, “vacation” mode kicks in whenever 36 hours pass without the SmartPlug detecting any hot water usage. As long as you’re away, the SmartPlug cycles the pump for 10 seconds a week to protect your pipes from corrosion. Otherwise, system stays dormant, which according to O’Brian, “goes a long way to help save energy dollars,” O’Brian points out. Upon your return, as soon as you start calling for hot water again, the SmartPlug seamlessly resumes, picking up right where it left off. Perhaps best of all is that, according to O’Brian, “installation couldn’t be easier.” Start by plugging the device into an electrical outlet, then plug the recirculator pump into the SmartPlug. Next, attach the SmartPlug temperature sensor to the hot water supply line. That’s it. 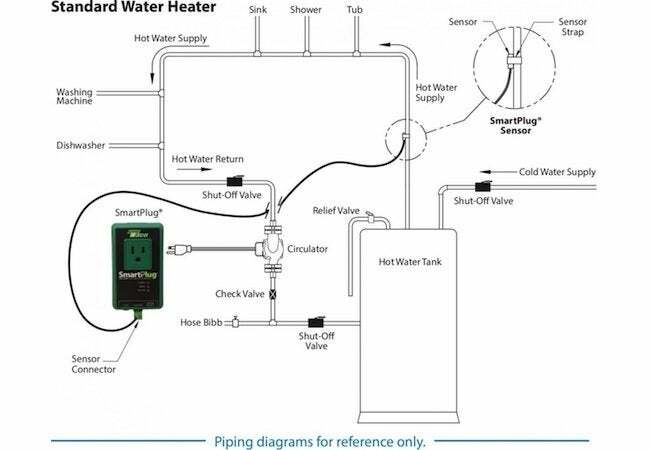 As O’Brian puts it, “Literally anyone can do it.” In part because of its no-hassle setup—but more so because the technology enables hot-water recirculation to deliver fully on its promises of convenience and cost savings—the SmartPlug has garnered more praise than you might expect for such a new product. In fact, at the 2017 International Air-Conditioning, Heating, Refrigerating Exposition, SmartPlug won not only the Innovation Award, but also Product of the Year. 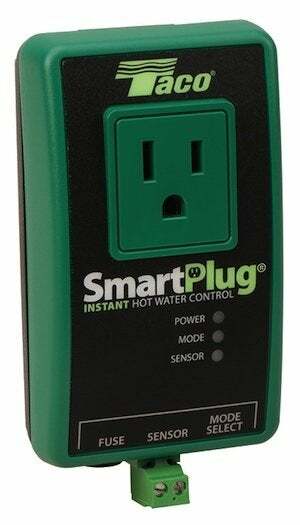 Purchase Taco SmartPlug Instant Hot Water Control, $125.95.